If you have had an accident involving a forklift truck, either as an employee-user or passer-by, then Cohen Cramer Solicitors can help you to claim compensation for your injuries and financial losses. We can help you claim the compensation that you deserve and on a No Win-No Fee, basis so it won’t cost you a penny if your claim is unsuccessful. Every day there is, in the UK, at least one person hospitalised as a result of an accident involving a forklift truck. Not all accidents are this serious but regardless of the extent of your injuries you are entitled to make a claim if the accident was caused by someone else’s negligent actions. A forklift truck accident can happen either at your place of work or while you are out and about, and can result from of a lack of operator training, inadequate premises or failure to maintain the forklift; whatever the cause of the accident you are entitled to claim compensation and we can help you. Employers are responsible for your safety and well-being at work or on their premises as a visitor and it is down to them to ensure that forklift truck drivers are sufficiently trained in using a forklift. 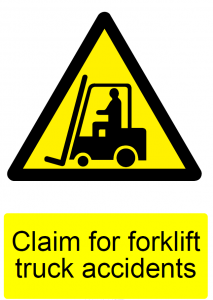 So if someone causes a forklift truck accident that leads to your injury you don’t have to worry about suing them directly; your claim will be brought against their employer; this is known as vicarious liability. The concept of vicarious liability applies regardless of where your accident took place. How much compensation will you receive ? We will claim compensation for your forklift truck accident injuries; how much depends on your injuries and how they have affected you. We will obtain a medical report, based upon your medical history and a physical examination to make sure that we have all the information we need to ensure you get maximum compensation. As well as claiming damages for your injuries we will also claim any financial losses you have incurred as a result of the incident. Treatment costs such as physiotherapy or long term care if needed as a result of your accident. Gratuitous care and assistance from family and friends, this covers helping you get to appointments, help with cooking, washing etc. All other financial losses arising from and as a direct result of the accident. Your claim can be dealt with on a ‘No Win – No Fee’ basis, this means that if for any reason, we are not successful then you don’t pay us a penny for the work we have done on your behalf.